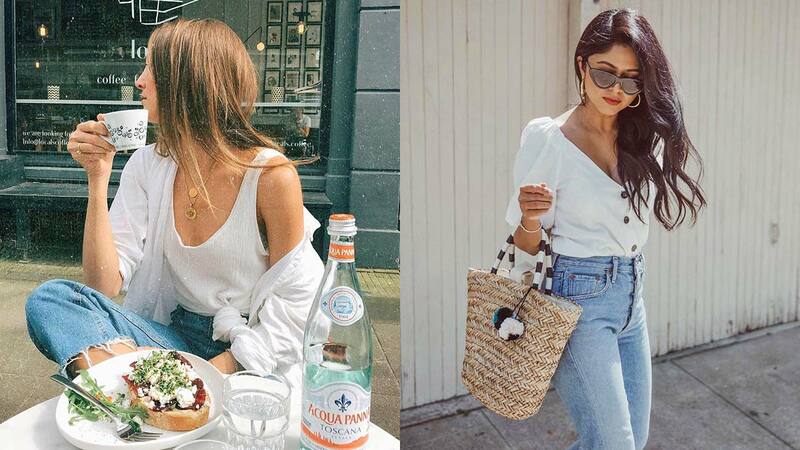 Nothing beats the refreshing appeal of white and denim. It's the fail-safe combo you can turn to on days when you're too tamad to dress up. Plus, white + denim is presko, so it's perf for summer. Now let's get onto the more creative ones! Tuck a puff-sleeve top into skinny jeans. Add texture by bringing a round straw bag and slipping on a pair of animal print heels. This couldn't get any simpler: A white tee + raw hem denim skirt. You can layer but still feel presko by putting on a white button-down over a white tank. Wear delicate gold jewelry to add flair. Look extra smoking by pairing a white bandeau with ripped jeans. Kill the denim-on-denim look with a cropped jacket, cutoffs, and a midriff-baring muscle tank. A chambray midi skirt is a great breezy choice that offers coverage. A casual off-shoulder top and high waist jeans are great for laid-back weekends. A sheer ruffled blouse balances the androgynous appeal of bermuda shorts. Slip on a silk camisole and mom jeans for a ~cool girl~ lewk. Look fashion-forward with a tailored asymmetric top, a pair of wide-leg jeans, and chunky-heeled sandals.